How are the Beast and the False Prophet “cast alive” into the Lake of Fire? | For What Saith the Scriptures? For What Saith the Scriptures? 600 Q&A Articles… And Growing! Do You Want to Go to Heaven? ← Is Hebrews 13:3 a reference to the Body of Christ? How are the Beast and the False Prophet “cast alive” into the Lake of Fire? Revelation 19:20 says as pertaining to the Second Coming of Christ, “And the beast was taken, and with him the false prophet that wrought miracles before him, with which he deceived them that had received the mark of the beast, and them that worshipped his image. These both were cast alive into a lake of fire burning with brimstone.” How are the Beast and the False Prophet “cast alive” into the Lake of Fire? Does that mean they will be unconscious once they wind up in there? When the Bible text says thus, it means that the Beast and the False Prophet will not experience physical death before entering the spiritual realm. They will be alive on Earth and Jesus Christ (at His Second Coming) will suddenly pick them up physically and toss them right into the Lake of Fire. In other words, there will be no burial for either, and thus no bodily trace of them left on the planet. They will not defile the Earth once the Second Coming occurs; namely, their graves will not even be here to corrupt the Promised Land. These two men, the Beast (Antichrist, political leader) and the False Prophet (religious leader), will have deceived the world for the seven years leading up to the Second Coming of Jesus Christ. Now, they will experience the wrath of God, eternal judgment, in the Lake of Fire and Brimstone (Sulfur). Even after 1,000 years in the Lake of Fire, they will still exist. They will not be consumed, for the fire will preserve them! Look at Revelation 20:10: “And the devil that deceived them was cast into the lake of fire and brimstone, where the beast and the false prophet ARE, and shall be tormented day and night for ever and ever.” You will notice in the earlier nine verses that 1,000 years have passed since the close of chapter 19 (our study’s opening verse). Stated another way, it is a millennium later that Satan himself meets the fate of the Beast and the False Prophet. They three, along with all of God’s other enemies (unsaved mankind and fallen angels), will “be tormented day and night for ever and ever.” There is no ended punishment; it is a literal eternity of suffering, full consciousness! If you want to see the human element added to the Lake of Fire, look at verses 11-15. Perhaps this may help you better understand the Beast and the False Prophet being cast alive into the Lake of Fire. Remember, there are other people who do not die in Scripture. For example, Elijah never died physically—he was caught up alive into Heaven (2 Kings 2:11). Neither did Enoch die physically—he too simply went to be with God (Genesis 5:23-24). Members of the Church the Body of Christ who are alive at the Rapture (future) will never experience physical death either (1 Corinthians 15:51-54—“we shall not all sleep [die physically];” 1 Thessalonians 4:15-17—“we which are alive and remain… we which are alive and remain…”). As Elijah, Enoch, and the living Church the Body of Christ meet eternal bliss without enduring physical death, so the Beast and the False Prophet meet eternal damnation without experiencing physical death! » Are 2 Thessalonians 1:9 and Revelation 14:10 contradictory? » Did Pharaoh drown in the Red Sea? » How can a “loving” God send people to hell forever? This entry was posted in ESCHATOLOGY (END TIMES) / PROPHECY, HEAVEN & HELL, How are the Beast and the False Prophet “cast alive” into the Lake of Fire?, How are the Beast and the False Prophet “cast alive” into the Lake of Fire?. Bookmark the permalink. Email Subscription for "For What Saith the Scriptures"
Enter your email address to receive email notifications when new Bible Q&A articles are posted. Why did Jesus say to throw the net on the “right” side? Were there five crosses on Calvary’s hill? Was Jesus Christ really crucified on Friday? Did Mary, Jesus’ mother, have a sister also named Mary? How long did it take for Israel to cross the Red Sea? Can you explain Matthew 11:12? What does Matthew 18:19-20 really mean? Enjoy our Bible studies? You may donate securely here. All donation inquiries should be sent to me at arcministries@gmail.com. Thanks! Check out our 60 new Bible Q&A booklets for sale. 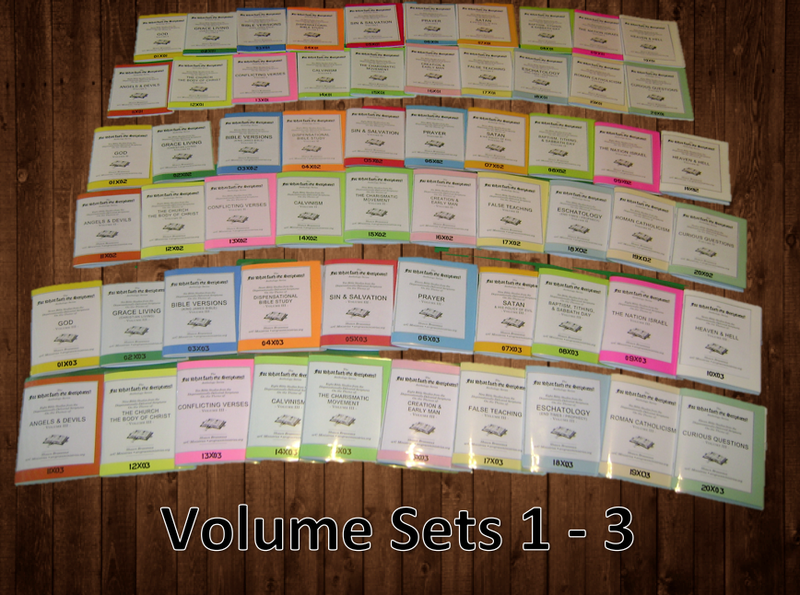 Over 450 studies, 3000 pages, and 20 themes! When Did the Church the Body of Christ Begin?